Sometimes, I really miss baking. I used to always bake for my students and co-workers, not to mention for myself, family, and friends. My cake pops were incredible. Blueberry peach cobbler, divine. Red velvet whoopie pies, to die for. French macarons, perfection. And there is very little better than my from-scratch pear and ginger pie with a salty-and-sweet Gruyère crumble crust. But ... I have given these things up, for now. Not because I won't allow myself them in moderation - I am generally okay with desserts when out with friends or at work functions. But baking by myself at home is still a problem for me. I go through fits of being better with it - I'll make something, enjoy it in moderation, and feel very proud of myself for staying in control. But when I am not feeling my best, the baking ingredients in the house can be very difficult to avoid. For now, it's easier for me to abstain entirely. But sometimes, I want something sweet. And I've been eating pears, apples, and bananas, and they're good, but not quite ... chocolate-y enough. A cheap chocolate bar isn't quite satisfying, and a higher quality chocolate bar is also usually higher in calories. So usually, I just abstain again. I couldn't think of a better name for these than one bearing the name of their creator, Katie. Calling them pumpkin brownies seems a bit deceiving, as the pumpkin flavor is not as pronounced as in, say, pumpkin pie or pumpkin bread. It's there, but subtly, and in addition to lending its flavor, also adds fiber and reduces the calories (as compared to following the box's baking instructions and using eggs and oil). There isn't much of a recipe here, per se. Get a box of brownie mix, and combine the mix with a can of pumpkin puree. Follow the temperature and time for baking listed on the box. Easy peasy! 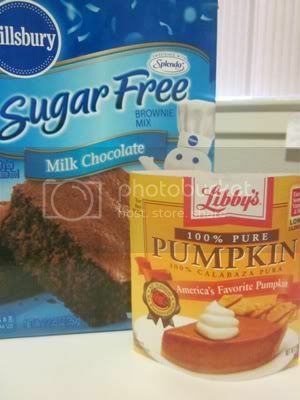 I made mine with sugar free Pillsbury brownie mix - I'm not typically a fan of artificial sweeteners (due to both taste and fake-ness) but got them since the calories were low and the servings-per-box was lower than regular mix. Next time, I'll go for the real deal - the Splenda taste was definitely present in these. But I managed to mask it a little by adding a pinch each of ginger and cinnamon to the batter before baking. Those are the two secret ingredients in my chocolate cake, I figured they'd work here too. Oh boy, did they! Thick, fudgy, a little spicy ... just what I wanted. And with my ingredients, the pan made 9 brownies at 136 calories each. I ate one yesterday when I made them, another later that day, and put the rest in the freezer for future PMS-ing emergencies. Close inspection of the ingredients list has inspired me not binge on them. Yikes. Reason #3 why I'm not crazy about artificial sweeteners. Definitely don't want that! What about you? Are you able to enjoy certain foods in moderation, or do you abstain entirely from individual foods/food groups? What's your take on artificial sweeteners? Have you tried 'No Pudge' brownies? They are amazing! What a good idea for a treat! And low cal too. 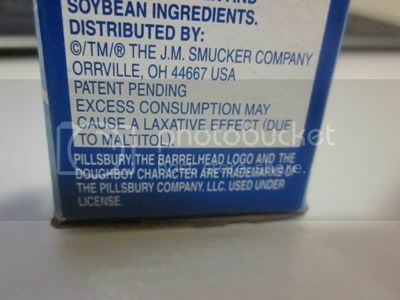 I do NOT do fake foods, esp artificial sweeteners because way back when they used to have cancer warnings on them (don't know if they still do). I don't abstain. I find I can't do that for long. But I LOVE chocolate so I do keep a bag of chocolate chips on hand and when I get a craving, I melt a tablespoon and mix with nuts or dip a banana in it. The other ingredients fill me up and I get a taste of the yummy chocolate. I am definitely going to try these. I eat chocolate oreo cookie in moderation as a treat, for some reason this is something I can have in the house and meter out in controlled portions. I like the chocolate ones vs. the regular ones as they give me more of a chocolate punch that I am looking for. Mary - those brownies look DELISH!!! you can also use zuccini as a substitute in baking and i make muffins with no sugar added applesauce or peanut butter instead of most of the sugar. Mmm, I remember really wanting to try those brownies when Katie posted the recipe, but I forgot about them! 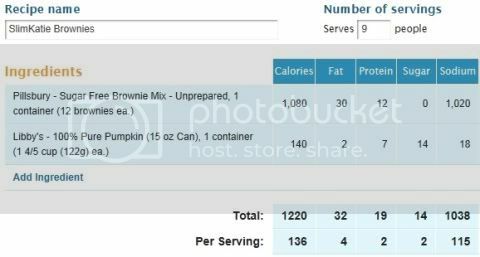 136 calories for a brownie sounds great. When I try to stay away from sweets, I end up going on a binge. LOL, I couldn't think of a name for them either, so I call them "Dr. Oz Brownies" since that was my food prop when I was on his show. Beverages and cheesecake tend to be the only things that I use artificial sweeteners in, and only Splenda. Sugar alcohols do nasty things to my intestines. And no one in my house wants me to ingest them. My husband bought some sugar free frosting and forgot to check the ingredient list, and I was in pain for the rest of the day. I'm so proud of you for realizing your triggers and working so hard to think of ways to work around it.